© Carolyn Kaster/Associated Press Protesters near the Federal Communications Commission in Washington last year as it prepared to vote on net neutrality. For the past 60 years or so, the Republican Party has declared itself the true party of decentralized government, the founding vision of federalism and what are sometimes called states’ rights. Whether its pious declarations were ever actually about more than securing Southern votes or limiting the rights of women and minorities has always been questionable, but at least in theory the party took federalism seriously. But now, with the party under new management and in control of every branch of the federal government, a profound transformation is underway. States’ rights still get lip service, at least when it comes to matters like limiting transgender rights. But the new reality is that we face a rising nationalist party, uninterested in local variation, aggressively devoted to molding the nation in the image of the party and its leader, Donald Trump, into one white-hot mass. California (surely the state now most tempted to leave the union) is the flash point. This week, it passed its own net neutrality laws, to ban blocking and throttling of the internet, as a stand-in for the federal net neutrality rules abandoned by the Trump administration in June. California has obvious reasons to want to protect an open internet: It is the land of the internet’s origin, and a place where tech entrepreneurship has thrived. If the Republican Party actually believed in economic decentralization, it might well accept the premise of state rules where the federal government explicitly disclaims any authority to act. But Attorney General Jeff Sessions, a self-declared states’ rights champion, declared within hours of the law’s passage that the Department of Justice will sue California for infringing corporate prerogatives — that is, interfering with the right of cable and phone companies to block or slow internet content. 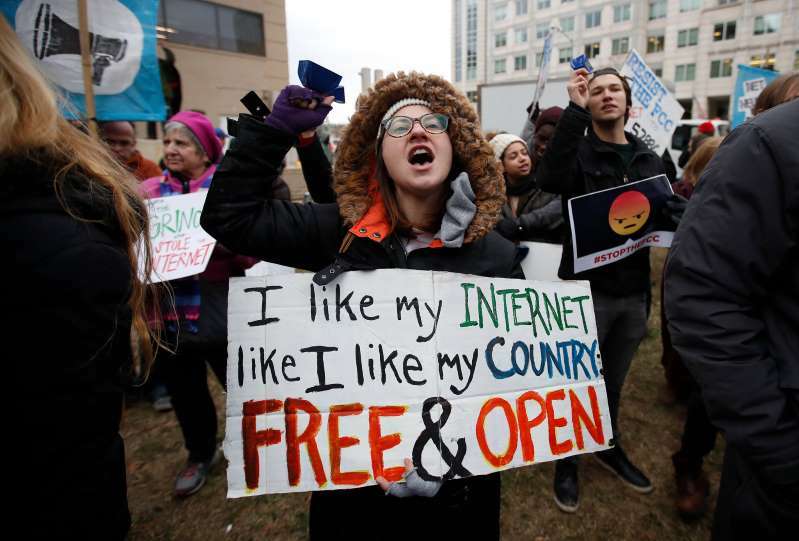 This attack on state net neutrality is no outlier but one of a series of similar invasions of states’ rights undertaken in the name of corporate sovereignty, which, in the age of a new nationalism, has been elevated above state law. The Trump administration is fighting hard to destroy California’s clean air rules, as if California had no legitimate interest in trying to keep its air clean. Likewise, the Republican judiciary has worked hard to transform the First Amendment into a charter of corporate privileges and immunities that invalidates state laws that would dare elevate matters like consumer privacy over an industry’s marginal revenue. Everyone knows that federalism arguments are used opportunistically in American politics and that proponents become opponents as soon as they gain control of the federal government. And there is certainly an element of opportunism in what the Trump administration is doing. But there are broader trends at work here, suggesting a deeper shift in what the Republican Party stands for. “Respect for local authority” and “acceptance of difference” are not themes that inspire the new Republican Party. Instead, as with other angry nationalist movements, it aims to destroy the enemies of the state in pursuit of “greatness,” a project that inherently demands a collectivist mind-set and submission to the party line. The ruthless (and illegal) pummeling of cities that dissent from Trump’s immigration policy is perhaps the most prominent example of what such jackboot anti-federalism looks like. A declining respect for federalism creates real dangers for the union, by making the nation’s existing polarization even more unbearable. For the states serve as buffers, softening the winner-take-all results of federal elections, and also serve as sanctuaries where people may move to leave behind a politics or a culture they cannot abide. To be sure, the fact that the states often fight political change is what has long propelled a powerful resistance to federalism on the left. But there is more to federalism than racism, for there is an inherent genius in a system that dampens political winds and allows people to vote with their feet as well as their ballots. This is a giant country, its size more resembling that of an empire than a republic. It always faces the danger of a tyranny of the Electoral College majority, the sense of rule by a distant power, lacking real consent of the governed, destructive of life and liberty. In our times, paradoxically, it is the states, serving as a democratic safety valve, that might just keep the union from falling apart. Tim Wu (@superwuster) is a law professor at Columbia, the author of the forthcoming book “The Curse of Bigness: Antitrust in the New Gilded Age” and a contributing opinion writer.